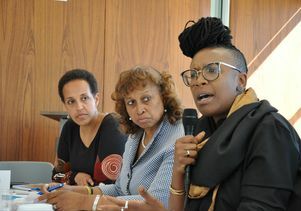 E. Tendayi Achiume speaks in New York City about human rights. Students participating in UCLA School of Law’s innovative international human rights programs got the rare opportunity to attend summits in New York and Geneva, Switzerland, during the fall semester to support the work of their professor, E. Tendayi Achiume. Achiume serves as the United Nations’ Special Rapporteur on Contemporary Forms of Racism, Racial Discrimination, Xenophobia and Related Intolerance. At UCLA Law, she teaches the International Human Rights Clinic and is a member of the core faculty of the Promise Institute for Human Rights, which sponsored the students’ travels. At the U.N. General Assembly in New York in October, Achiume presented two reports: One focused on the ways in which national populism from Austria to the United States threatens racial equality, and the other detailed the rise of neo-Nazism on the internet. She also convened a discussion with representatives of U.N. member states and human rights agencies to discuss her reports in light of recent hate crimes, including the mass shooting at a synagogue in Pittsburgh, Pennsylvania. 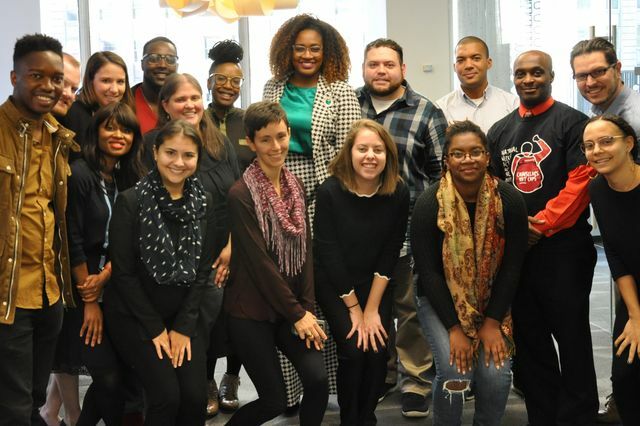 In New York, Achiume was joined by six International Human Rights Clinic students — Ohene Ampofo-Anti, Amanda Brown, Julie Dargus, JD Dombrosky, Rie Ohta and Olivia Florio Roberts — along with UCLA Law research and advocacy fellow Kyle Elliot Fees. 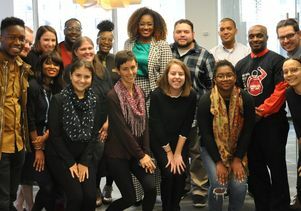 Students participating in UCLA School of Law’s international human rights programs in New York City along with their professor, E. Tendayi Achiume, top row, fifth from left. The students helped Achiume draft talking points for the event, and they took extensive notes during the dialogue with the General Assembly. They also organized meetings involving prominent civil and human rights groups, including the American Civil Liberties Union and the Ford Foundation. 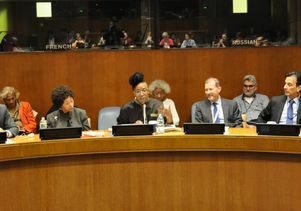 E. Tendayi Achiume speaks at the United Nations. 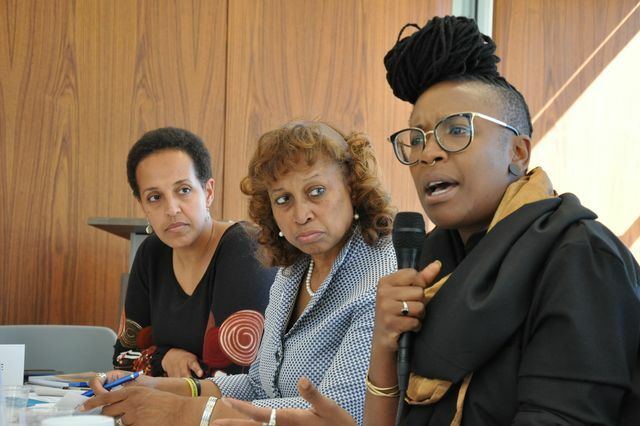 Shortly after the New York trip, Achiume, human rights fellow Sarah Khanghahi, who graduated from UCLA Law in 2016, and three International Human Rights Clinic students — Daniel Johnson, Abigail Kerfoot and Nicole Van Zyl — traveled to the University of Geneva for a conference on human rights and cyberspace. It was the second such trip that Achiume has led to Switzerland this year. Achiume convened a workshop titled “Human Rights, Racial Equality and New Information Technologies: Mapping the Structural Threats.” In addition to their work preparing the event and taking notes during the discussion, the UCLA Law delegation met and networked with U.N. staff and attended the first public talk by former Chilean president Michelle Bachelet, who was appointed as the U.N.’s high commissioner for human rights in August 2018. “As Bachelet — herself a survivor of human rights violations under the Pinochet dictatorship — expounded on the role that human rights must play today, two indigenous Chilean women took the stage with banners alleging human rights violations during Bachelet’s own presidency,” Kerfoot said. 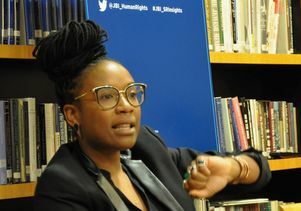 E. Tendayi Achiume, professor at UCLA School of Law, speaks in New York City about human rights. 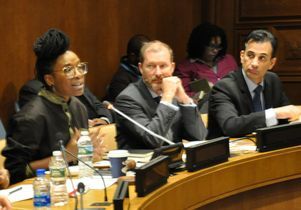 E. Tendayi Achiume, professor of law at UCLA School of Law, speaks at the United Nations in New York City.